Can Consuming Too Little Sodium Cause Problems? People concerned about getting too much sodium in their diets will often try to cut it out entirely, checking food labels and recipes for any sign of added salt (sodium chloride). While this may be the prudent thing to do, especially if you have high blood pressure, there may be risks if you have too little sodium. As much as sodium has been demonized in the American diet—mostly because we consume far too much—it actually plays as vital a role in the functioning of our bodies. Sodium (like calcium, magnesium, phosphate, and potassium) is an electrolyte, meaning that it creates an electrically charged ion when dissolved in fluids like blood. Our bodies need electrolytes are they facilitate nerve impulses and regulate body functions such as heart rate, digestion, respiration, brain activity, and blood pressure. For its part, sodium helps maintain the fluid balance in and around cells (including the volume of fluid in the blood) and helps regulate nerve and muscle function. High sodium levels in your blood—above 145 milliequivalents per liter (mEq/L)—can affect the fluid balance and contribute to high blood pressure. By contrast, low sodium levels (below 135 mEq/L) not only decrease blood pressure but interfere with the activity of nerve cells and the muscles of the heart and digestive tract. While you lose a little sodium every day when you sweat or urinate, it is generally not enough to cause a sodium deficiency unless you are severely malnourished. By and large, the foods we eat provide us with more than enough sodium to replace whatever we lost. With that being said, it is possible to be sodium-deficient if you overexert yourself and lose excessive amounts of sodium in sweat. On the flip side, you can drive your sodium levels down by drinking too much water and diluting its concentration. Both of these things can lead to a potentially dangerous condition known as hyponatremia. With hyponatremia, the extreme loss of sodium can trigger symptoms ranging from muscle cramps, nausea, vomiting, and dizziness to shock, coma, and death. This is why athletes are routinely advised to consume electrolyte-rich sports drinks during strenuous activities to compensate for the loss of sodium and other essential minerals. In term of the excessive consumption of water, it generally doesn't happen in daily life as you would need to drink no less than 6 gallons of water for many days or weeks before it becomes an issue. However, if you drink too much during an endurance event, such as a marathon, you can quickly develop hyponatremia even if it's a sports drink. This is because our kidneys can eliminate between 5 and 8 gallons of water a day but can't get rid of more than 27 to 33 ounces per hour. As a result, endurance athletes are today advised to drink when thirsty rather than forcing extra fluids. There are other conditions that can cause hyponatremia by either depleting fluid level or causing the excessive retention of fluids. This is especially true among older adults who take medications or have medical conditions that place them at risk. According to the Office of Disease Prevention and Health Promotion (ODPHP), you need around 1,500 milligrams (mg) of sodium per day to replace whatever you lose in urine and sweat. In most cases, we consume enough in our regular diet and then some. The ODPHP recommends that American adults consume less than 2,300 milligrams of sodium per day as part of a healthy dietary routine. Furthermore, African Americans, people with high blood pressure, and those over 50 are advised to limit their intake to 1,500 milligrams per day due to the increased risk of cardiovascular disease. Consider how quickly the sodium levels add up if you eat just four ounces of beef (60 mg), a cup of milk (140 mg), one cup of greens (100 mg), two eggs (350 mg), an ounce of blue cheese (375 mg), and one slice of refined white bread (175 mg), and a cup of plain yogurt (150 mg). Even without a grain of added salt, you're already more than halfway to your 1,500-milligram target. Unfortunately, Americans tend to eat far more than this. In fact, according to ODPHP, the average American consumes around 3,400 milligrams of sodium day due in large part to the packaged and processed foods we grab at the grocery store. Dietary Reference Intakes. Institute of Medicine of the National Academies. http://www.nationalacademies.org/hmd/Activities/Nutrition/SummaryDRIs/DRI-Tables.aspx. Gropper SS, Smith JL, Groff JL. Advanced Nutrition and Human Metabolism. Sixth Edition. Belmont, CA. Wadsworth Publishing Company, 2013. Office of Disease Prevention and Health Promotion. (2015) 2015-2020 Dietary Guidelines for Americans. Washington, D.C.: U.S. Department of Health and Human Services. Overhydration. The Merck Manual. https://www.merckmanuals.com/home/hormonal-and-metabolic-disorders/water-balance/overhydration. Verbalis, J.; Goldsmith, S.; Greenberg, G. et al. Diagnosis, Evaluation, and Treatment of Hyponatremia: Expert Panel Recommendations. Am J Med. 2013;126(Suppl 1): S1-S42. DOI: 10.1016/j.amjmed.2013.07.006. Is That Gatorade You’re Sipping Actually Harming Your Health? 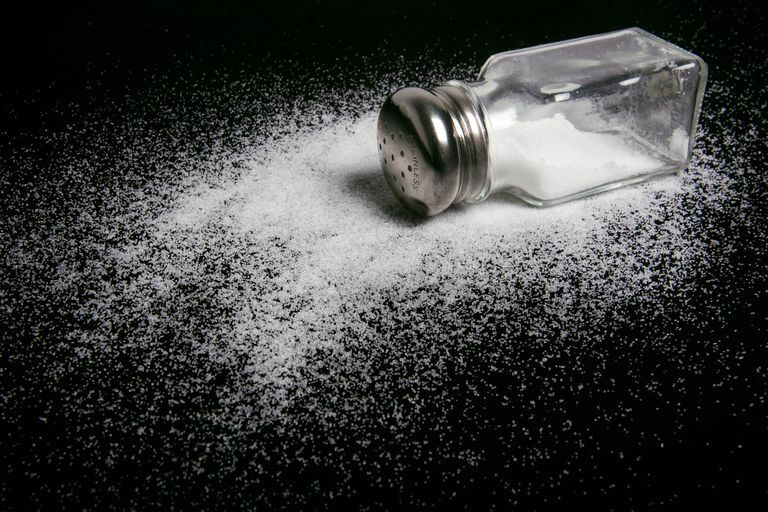 Do Ultra-Endurance Athletes Need to Eat More Salt? Retail Dietitians: What Can They Do for You? Is Mayonnaise Bad for Your Health?